I will share a secret that isn’t apparent when looking at how I attach the top skins. The Bar-clamps holding the strong-backs do not do the real clamping! I do not even turn the clamping screws! 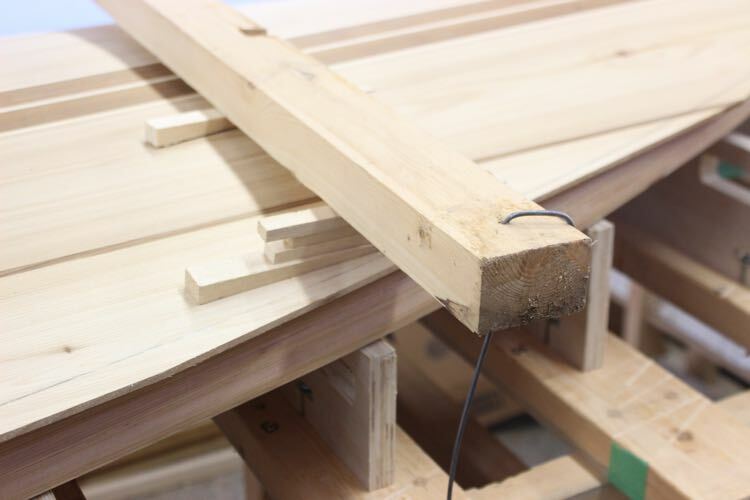 My clamps are raised into position and the spring in the strong back applies enough pressure to the centre of the panel. Homemade 14:1 wedges are then used to apply pressure where needed. If the clamps were tightened the way you might think, the centre of the paddleboard would crush before the rails were to get any pressure at all. Even if you were to use thinner strong-backs there is no way to get even pressure over the curved surface. 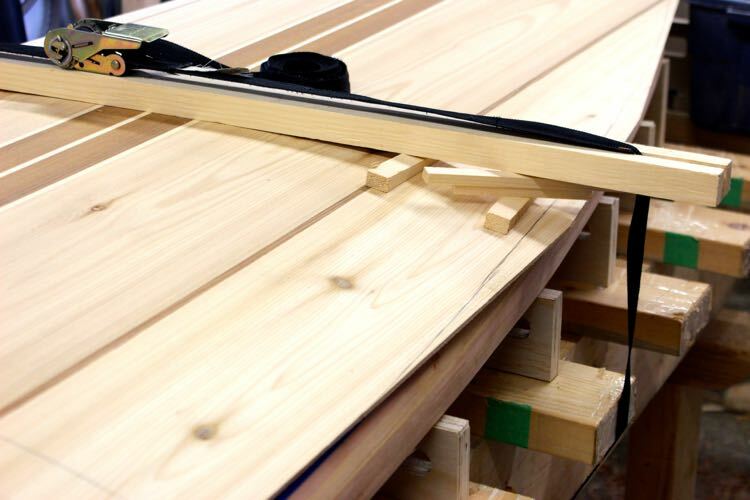 Most homebuilders do not have walls full of clamps for building a wood paddleboard kit so here is a list of alternatives listed from best to worse. 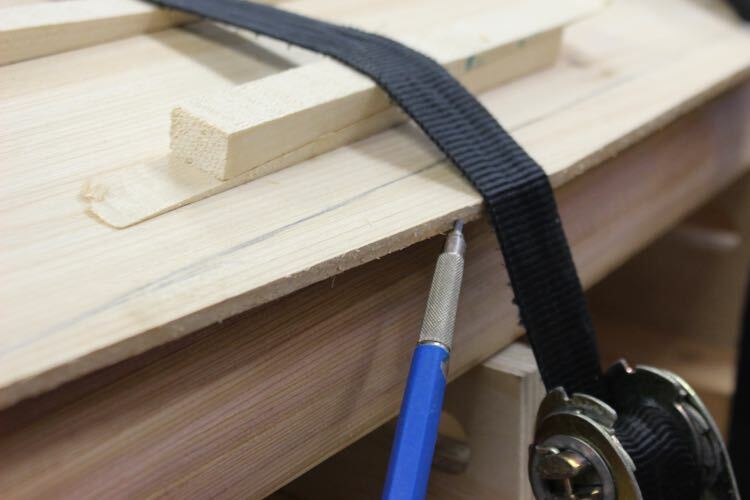 A webbing strap used together with a strong-back works so well that I might stop using clamps for this step. 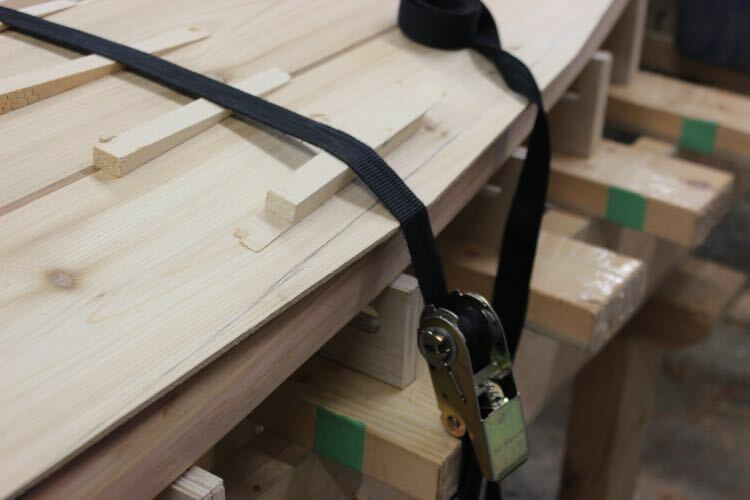 The notch in my strong-backs locks the Bar-clamps in place but it worked perfectly to centre the straps. The strap shown has the racket handle but I plan on buying the simple cam type webbing straps that you can just pull to tighten. 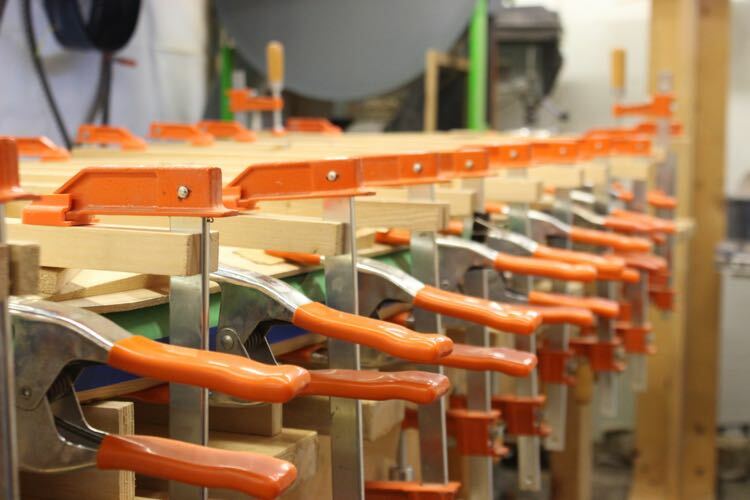 Why would I stop using clamps that I already have? I currently have to align one clamp and then run around the board to adjust the second clamp. I plan on attaching webbing to my strong-backs and then simply lay all 15 strong backs on the board at once. I will be able to simply reach under the assembly table and grab the loose end and tighten all the strong-backs from one side of the board! Tip: Princess Auto in Canada, Harbor Freight in the US, sells webbing straps for about $2 each! Rope can also be used. Tie a loop in one end and then lock with a half hitch. This is slightly more cumbersome but this option also works for about $5 worth of rope. 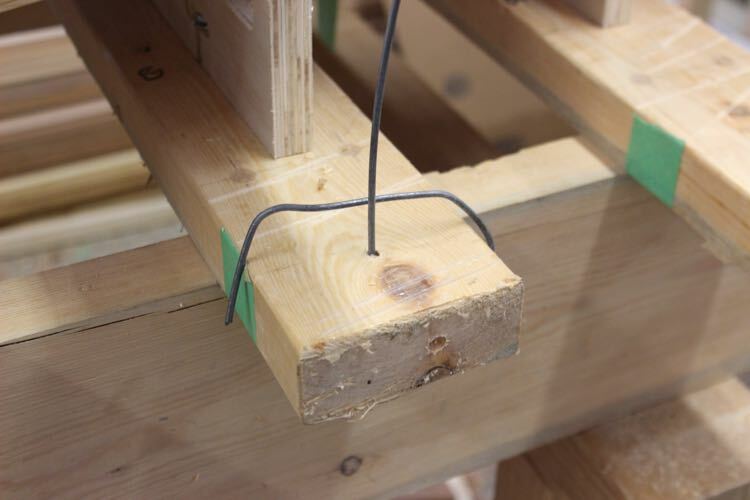 Wire is an option for builders who are not comfortable with knots. This fencing wire is stiff enough that simply bending it over the strong back will lock it in place. If you drill a small hole in your assembly table and one in the strong back, the wire will hold by simply flexing the strong back and then bending the wire. If you choose this option, turn an eye in the top of the wire with a pair of pliers so you don’t get scratched. Be careful when you release the tension the next day. I pressed on the strong back with one hand over the wire to release the tension and snipped the wire. No matter how you do this wear eye-protection. The simplest option isn’t the best solution in this case. 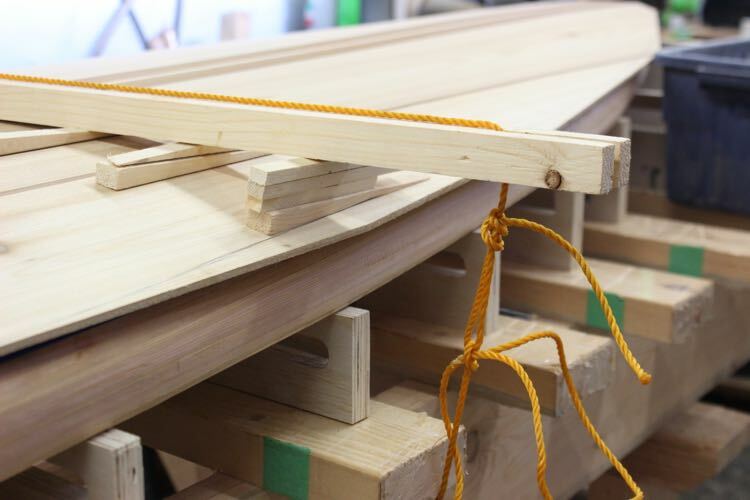 Builders have successfully built wood paddleboard kits with just webbing straps used like the picture above. The problem with this technique is that the cantilevered overhang should have NO pressure on it. The wedges are stacked where the pressure should be applied and NO PRESSURE should be applied on the cantilevered section. 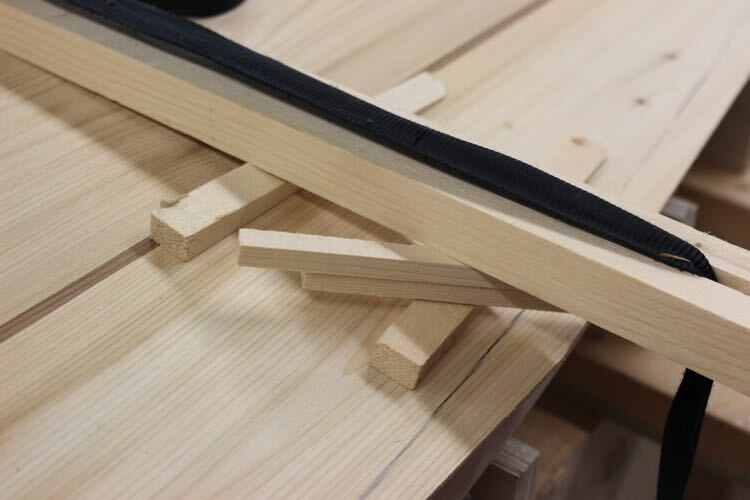 There is about an inch of extra material that could easily crack along the grain. If you are going to attach your top like this, trim the top panel as close as possible to reduce the cantilevered excess. Since enough strong-backs for a paddleboard can be made out of a single 2×4 I do not think it is worth the risk to use straps by themselves.